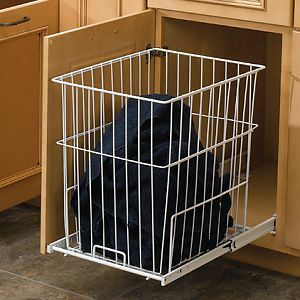 Another option for storing dirty clothes, the Pullout Wire Hamper is easily removable for carrying to the laundry room. Features 1.5 cu.ft. 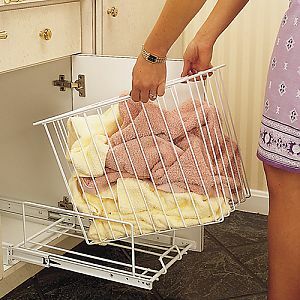 of space in an easily removable basket. Full-extension slides allow full access to containers and provide the strength to handle even the heaviest loads. Shallow 18" depth, ideal for vanity applications. 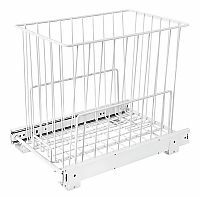 Comes fully assembled and requires only four screws for installation. NOTE: For door mounting capability, use with door mount kit (sold separately). Please call or use our Online form to receive an RGA (Return Goods Authorization) number within 60 days of purchase prior to returning merchandise, returns WILL NOT be accepted without one. Thirty-five percent (35%) restocking fee applies to all returns. Defective products will be replaced. Exception: Up to a fifty percent (50%) restocking fee may apply on pull out pantry systems and corner units.